Transparency Market Research (TMR) has published a new report titled ‘Bone Grafts and Substitutes Market - Global Industry Analysis, Size, Share, Growth, Trends, and Forecast, 2018–2026.’ According to the report, the global bone grafts and substitutes market was valued at US$ 2.7 Bn in 2017. It is projected to expand at a CAGR of 4.3% from 2018 to 2026. Factors such as rapid technological changes from autografts to allografts and penetration of synthetic and tissue-engineered bone grafts are propelling the growth of the bone grafts and substitutes market. Moreover, an increase in demand from customers and rise in industry standards are spurring the global bone grafts and substitutes market. 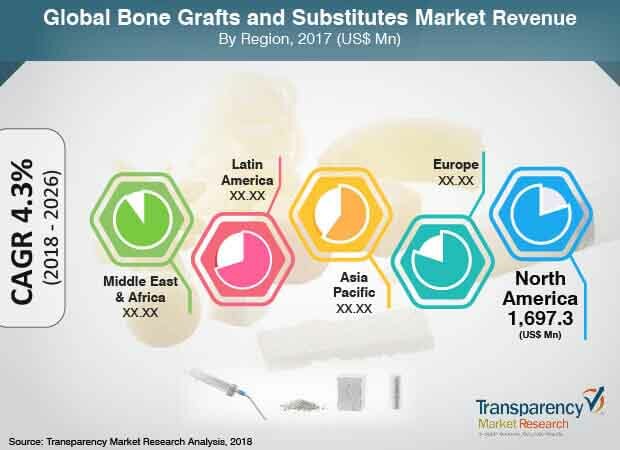 North America and Europe are projected to dominate the global bone grafts and substitutes market, owing to a higher rate of adoption of and awareness regarding bone grafts and substitute products. Asia Pacific, Latin America, and Middle East & Africa are regions with high potential for the bone grafts and substitutes market. The market in Asia Pacific is expected to expand at a CAGR of 5.0 % from 2018 to 2026.